The biggest news of late in Seattle is Bertha and what’s stopping the multi-million dollar drill from its appointed task of cutting a tunnel deep under Seattle. Last Friday, the big borer hit an unknown object that the 57.3-foot-diameter cutting face couldn’t get through. This completely surprised everyone because Bertha was designed to chew through concrete and break up and crack large boulders. Plus, surveys showed nothing was in her path. Yet, just 1,000 feet in and 60 feet underground, Bertha sits still, waiting for her handlers to figure out what is up. Of course, speculation has been rife as to what is the Berthablocker. Reflecting the city’s other passion, the leading candidate in a Seattle Times poll is a guy who plays for the Seattle Seahawks, followed by Jimmy Hoffa, Seattle’s soon to be former mayor, the eminent Tolkien subterranean beast, Balrog, and Cthulhu, a mythical character created by H.P. Lovecraft. More realistic ideas include Ballast Island (a small bit of land created by ballast dumped from ships docking at wharves in early Seattle); a large, glacial derived boulder; well-casing; or trash dumped during the many years of filling in the Seattle waterfront. The area where Bertha stopped is an historically interesting spot; it is under what was the southern most point of land in what would become Seattle. (It’s also below the location of Seattle’s most notorious early whorehouse.) 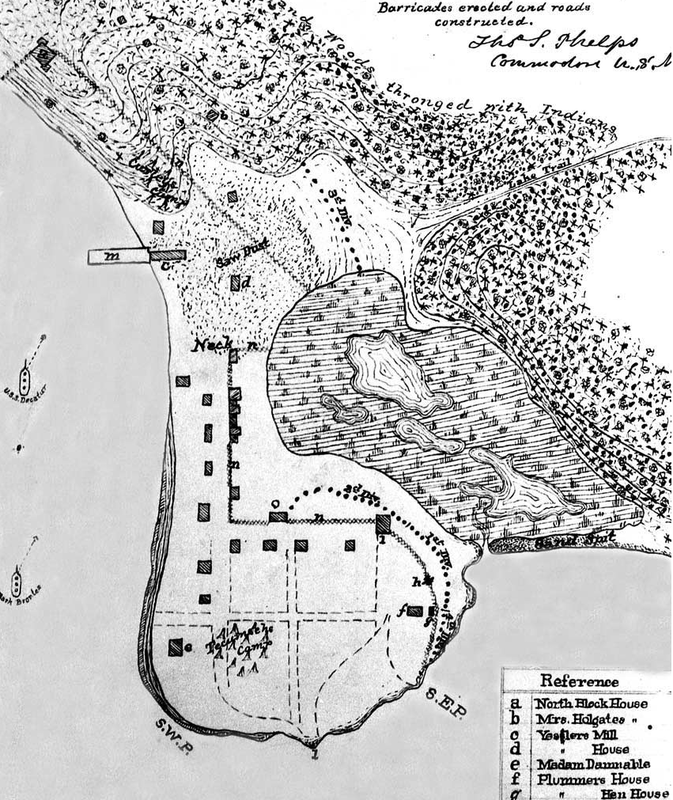 When Seattle’s founding families arrived on the eastern shore of Elliott Bay in 1852, the area around what is now South Jackson and South Main streets was a high mound of land, which would become an island at very high tides. (Some call this Denny’s Island, though Maynard’s Island or Maynard Point are more appropriate because Doc Maynard was the first person to own this land.) Behind the mound was a lagoon or salt marsh, which the early settlers—primarily Henry Yesler—filled in with sawdust and other detritus. What there is little of, though is Denny Hill, which was leveled between 1898 and 1931. One of the great myths of Seattle is that the spoils of the former Denny Hill went to fill in the tideflats or to make Harbor Island. Of the roughly 10 million cubic yards of dirt washed off and scooped out of Denny Hill, no more than perhaps 100,000 to 150,000 cubic yards ended up as useful fill along the waterfront, and very little of that went into the tideflats and none into Harbor Island. So what is blocking Bertha? It seems that an erratic of some sort is the most likely source but there is always the possibility that some unnatural object is down there. During the early years of Seattle, the landscape was constantly being manipulated through projects large and small. Someone could have sunk some sort of shaft or item for an unknown reason. At this point, we can only wait to see what the Department of Transportation finds. Personally, I do hope it is not an erratic; it would be great to find some new mystery down there. Gentle readers, when was the last time you saw a geologic cross section in the newspaper? That is, I think, the most fun part of this whole big deal. PS- I vote for a Jackass Mountain conglomerate erratic. My bet is it’s all the “no” votes by Seattleites that were promptly buried and ignored. No worries, I’m sure someone will invent a machine to throw money at the obstruction until either it, or our money, is gone. 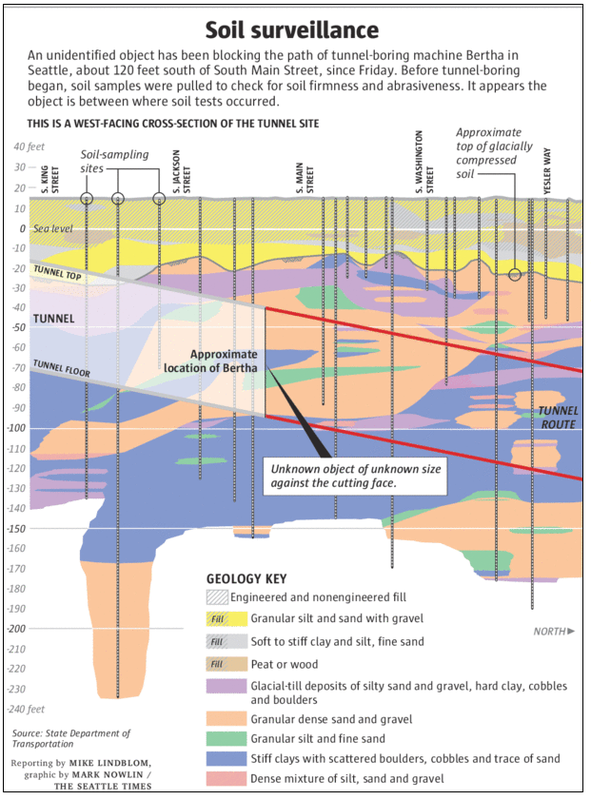 We ran a similar cross section in the newspaper in July 2010, for the tunnel section a few blocks north. For this week’s story, we found the Geotechnical Baseline Report (from a public records request I made a few weeks ago that we’ve stored) and grabbed the area near Main Street — capably converted by graphic artist Mark Nowlin. By the way, great article here by David Williams! @ Ken C. Well said. If a very large erratic is lying flat, or nearly so, against Bertha’s cutting face I suppose it would cause blockage. And that erratic is most likely some very hard rock! Curious. What happened to the other 9.9 million cubic yards of dirt from Denny Hill? Was it washed directly into the Bay? My vote is for a Nephrite or even Jadeite Boulder of immense proportions. I used to find small bits of such rocks in the local rivers. That is a very tough nut to crack and only abrades very slowly. Maybe Bertha can carve the world’s largest jade ring? I’ll go for the Balrog. Most are saying the TBM was designed to cut through rock. However, this wouldn’t be the first time a drilling machines operation didn’t live up to advertised capabilities. The TBM can cut through solid rock. The problem is that if this obstruction is a boulder surrounded by loose wet soil or sand, the cutter can’t get a good grip and the boulder would keep shifting as the cutter rotates. If this same rock were surrounded by hard clay, the cutter would have no problem breaking it up. If a large loose boulder is the problem (and not some metal piling or whatever), I wonder why having divers break it up is the best way through it. It seems like I’ve seen other TBM sites use grout injections to stabilize loose sites. And there’s a Swedish site that had such bad groundwater problems that they froze the site solid with cooling loops. In response to KPY, yes, most of Denny Hill ended up in Elliott Bay. If you look at bathymetry maps you can still see it, just offshore from the Edgewater Hotel. Loose soils? Not so. The cross section above shows the top of the borehole below a glacial till stratum. I drilled about a half a block from here in October and hit 50+ blowcount sands and silty sands at 40 feet. Given the depth and soil profile, the only manmade object to stall the machine would be a vertical metal shaft such as a steel well casing or piling, and it would have to be of a fairly large diameter, right? It seems more likely to me that it would be a glacial erratic or a pile of Pleistocene logs. However, these seem possibilities seem remote too. It is pretty cool to see a geological cross section in the newspaper.